The Postgraduate Education Division (PED) of the Medical Education Center conducts valuable continuous educational programs, which consist of early-stage clinical trainings (two-year residency programs) and middle to last-stage clinical trainings (four to six-year fellowship programs), as well as lifelong educational programs for medical professionals. 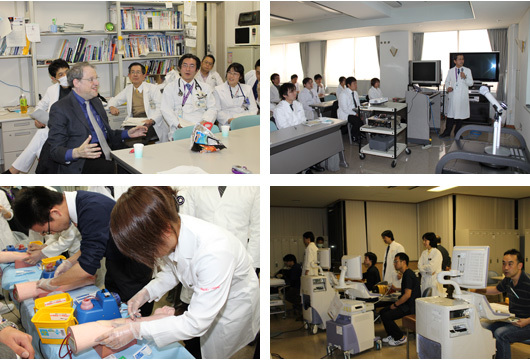 Whereas most clinical trainings are conducted at Saitama Medical University Hospital, Saitama Medical Center and the International Medical Center, the PED controls the training quality in these continuous programs. It organizes post-graduate educational lectures, the skills-laboratories and educational networks among other universities and local hospitals. It also manages the individual lifelong education for medical professionals outside our hospitals. The Graduate School of Medicine Doctoral Program was inaugurated in 1978 with the following quorum (see table below). Using guidelines established by each respective specialty, individual departments offer their own special curriculum for each postgraduate course. The goal of the postgraduate course is to educate the future leaders of clinical and basic medicine who are capable of conducting creative research work, or high-quality clinical studies. Our doctoral programs consists of three major courses which include biological, social, and clinical medicine, and involve 31 subjects connected to various research areas in basic and clinical medicine (see table below). It is feasible for a PhD candidate to perform research work under the tutelage of Graduate School faculty members in the Department of Basic and Clinical Medical Science. This program focuses on developing practical medical research abilities with an ethical mind. The number of persons earning a doctorate degree through the Graduate School of Medicine has grown to 418 since its implementation in March of 1982. In addition to this, there have also been 761 individuals given doctorate degrees through the presentation of their thesis papers, raising the total number of diplomats to 1,179 by the end of July 2011.